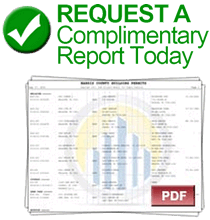 Residential construction in Florida is on a high, and every year it just keeps getting better. Considering the fact that Florida’s population grows by nearly 1,000 people every day (source: StateofFlorida.com), it is no wonder that last year housing starts reflected a year-over-year increase of 14%, resulting in more than 83,000 new permits on file with HBW. The regions that experienced the greatest growth in new residential construction last year include the eastern and southwestern portions of the state: Northeast Florida experienced a massive 27% year-over-year increase in housing starts last year, resulting in nearly 14,600 new permits; Southeast Florida had a year-over-year spike of 25% (9,911 permits); and the southwestern region experienced a 19% year-over-year increase in housing starts that resulted in approximately 15,700 new residential construction permits. Areas that held higher concentrations of new residential construction activity include the west, southwest and central areas of the state. West Florida ranked #1 for total new permits having more than 17,300 housing starts, reflecting a 9% year-over-year increase in new home construction. 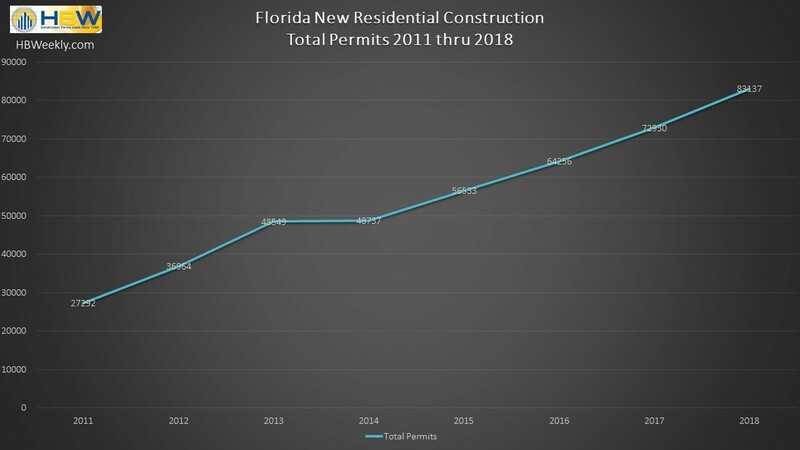 Southwest Florida ranked second-highest with 15,700 new permits, and Central Florida was not far behind with a 2% year-over-year increase that resulted in approximately 15,280 new residential construction permits for the year. From a county perspective, there were a few counties that caught our attention due to high levels of new construction activity. In Central Florida, Orange County held the highest concentration of new residential construction in comparison to all counties reviewed statewide. Last year, Orange County experienced a 9% year-over-year increase in new home construction, resulting in nearly 6,530 permits in 2018. In the western region, Hillsborough County ranked second-highest out of the Florida counties reviewed with more than 5,300 housing starts (10% annual increase). In the southwest, Lee County demonstrated an impressive 20% year-over-year increase in housing starts, resulting in more than 5,000 new residential construction permits on file with HBW. When breaking down the annual permitting data further and isolating higher value (>$500k) construction projects, the greatest amount of higher value housing starts could be found in Central and Southeast Florida. Central Florida had the highest concentration of residential construction permits valued above $500k; with a 5% year-over-year increase, there were nearly 1,270 higher value housing starts in Central Florida last year. In the southeast, there was a 15% annual surge in residential construction valued above $500k, resulting in approximately 1,200 new higher value permits on file with HBW in 2018.